Interested in joining? We'd love to have you! We meet every Tuesday at 7:30 AM Dundas Valley Golf and Curling Club 10 Woodleys Lane Dundas. Call 905-304-3682 for more information. Our meeting last week was cancelled due to a mix-up/locked door at the golf club...but in the meantime here is a great update from Bob Morrow on the presentation of donation from our club in Portugal. 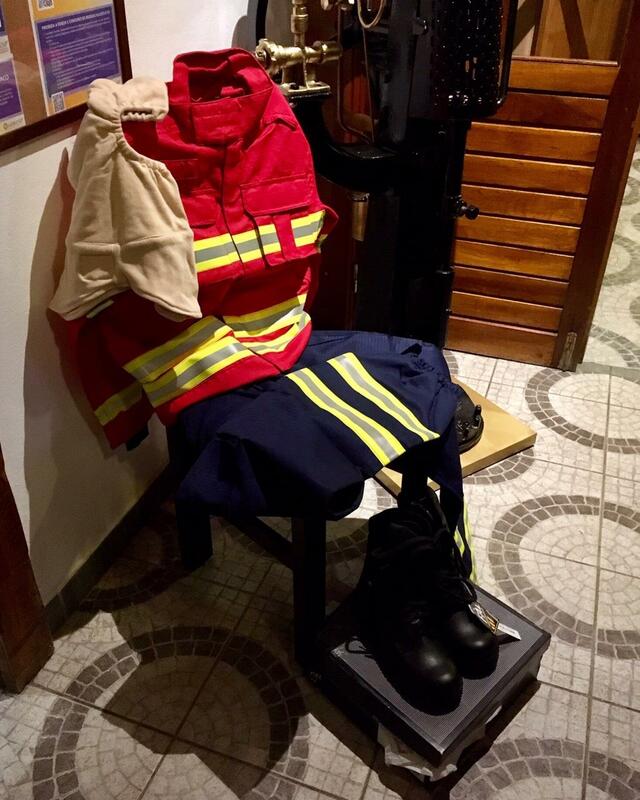 With many thanks, and credit given, to the board and the club of Dundas Valley Sunrise Rotary Club, last night, I was able to present 200Euros towards the purchase of 4 uniforms for the local volunteer “bombeiros” or fire fighters who have been battling terrible fires in the Algarve, in Portugal. 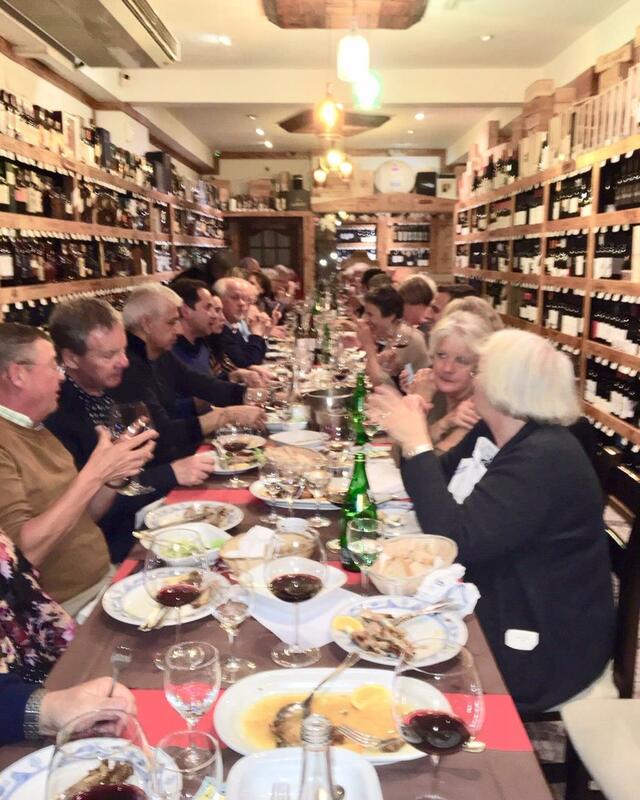 The evening was interesting as a fundraiser as well...dinner was 35 Euros (cost to the club was 25 Euros), the wine was all donated by the winery, and through a raffle and sales of the wine, they raised quite a bit of money in one evening and had great fellowship at the same time. Several people indicated they would contribute amounts to every bottle of wine sold. 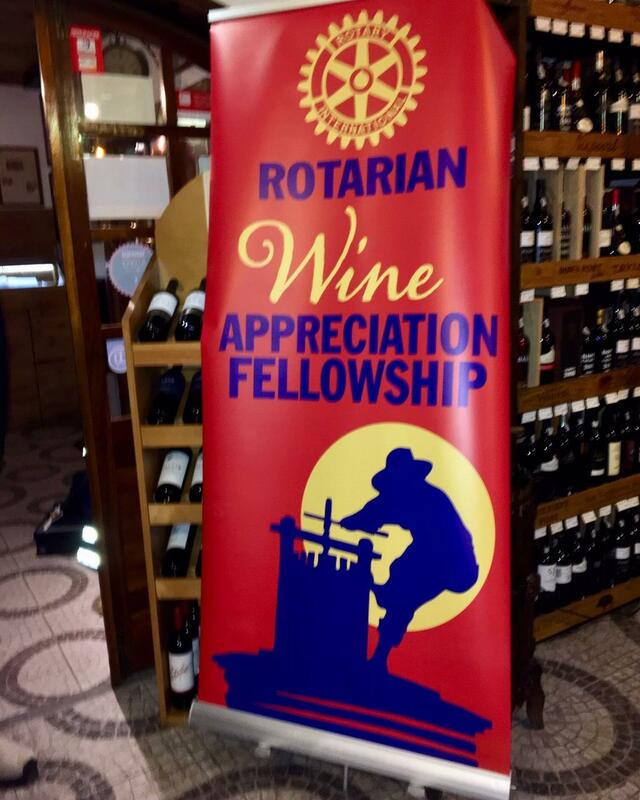 For example, my Rotarian friend and VP of the Wine Appreciation Fellowship, Claire Larson, gave 25 cents for every bottle sold that evening...the winery gave 30 cents, and one other individual gave 45 cents...so, for every bottle of wine sold, they were getting 1 Euro. 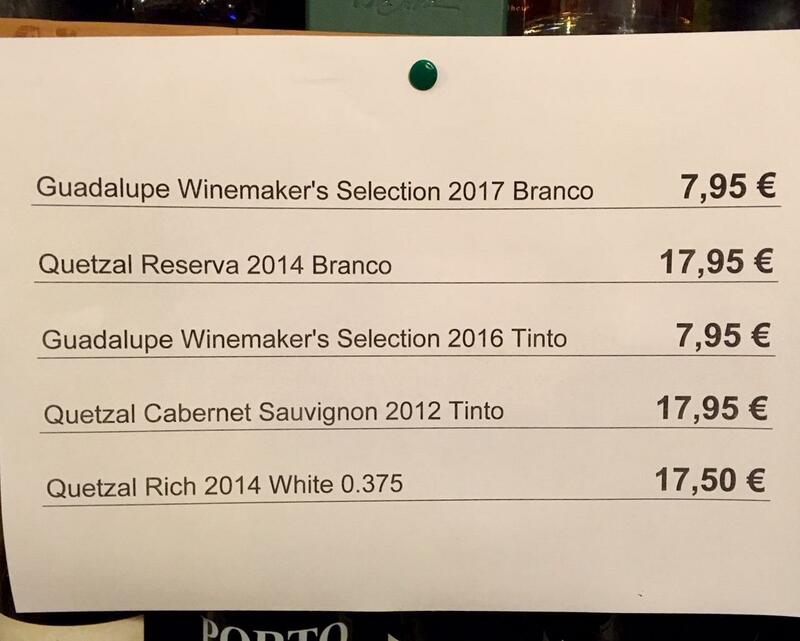 I calculated (and I admit it was a rough guess), that they sold 400 - 500 bottles of wine following the dinner. Great fundraiser, really good fellowship, and, again the Dundas Valley Sunrises Rotary Club looked great. MANY people came up to me afterward and thanked the club for its contribution. The “wine room” at the back of the restaurant (this is one half), was completely full. Although this film had an initial impact on Marisa, it wasn’t until 2015 when her focus truly shifted to Climate Change with the release of her book “Code Blue”. One of the biggest questions around Climate Change is “Is it real?” Nothing can be 100% sure however all evidence points to it being true so we should prepare for the worst. We simply need to watch the news to recognize that Climate Change is happening. Scientists say carbon dioxide levels are rising creating a greenhouse effect….that warms the planet. 97% of scientists worldwide agree that global warming trends are directly related to climate change. In addition to these scientists, hundreds of large international organizations also agree. When we look at a list of what countries contribute to global warming, China tops the list followed by the USA and India. Canada sits down on this list and one would think we are a low contributor to global warming however if you look at it as per capita against population, we are one of the worst contributors. While the USA is not signed on to the Paris Climate Agreement, they are in fact lowering emission levels but this is due to State and municipal governments who continue to support emission reduction initiatives. China has targeted 70% below 2005 levels by 2030. India is an area of concern however they are making progress in renewable energy which they are a world leader in. They are the 4th largest wind power country and they have completed the world’s largest solar plant. We are the first generation that understands climate change and the last generation that can do anything about it. Since Oct 2018, 3 separate organizations have said rapid environmental change needs to take place by all nations. They noted hundreds of billions of dollars in damage to the US economy due to climate change. The Rio Earth Summit in 1992 set emission targets for all countries to meet. Since then other summits have set new targets yet despite all of this, omission levels have grown by 20 percent in Canada alone. We have missed every target from all climate change conferences. IN 2018 alone, the earth experienced at least 8 major climate related disasters around the world. Dave talked about communications and technology changes through the ages and the affect this has had on the environment. We continually strive to improve our comfort and security and overall enjoyment of life while this contributes to environmental damage. Dave pointed out that damage to the environment is not new…it began back in 1750. and accelerated as technology advanced. World co2 emissions continue to grow. 3) Change our response to what we know. Until the general public understand the crisis they won’t support the strong actions required. Governments need to save the environment so that we can have a livable society and economy. As individuals what can we do? What can we do in our daily lives? The Good Shepherd has a budget of about $12 million per year with $7 million coming from government sources with the rest being fund raised. A history of the Good Shepherd is available on their website. The first service provided was the Men’s Centre which opened in 1961 and served 80 males. In 2018 742 individual men stayed in the Centre and more than 52,000 meals were served. The Venture Centre Marketplace is set up like a grocery store and is also the location where donations can be made: https://www.goodshepherdcentres.ca/food-bank-clothing-room. More than 80,000 people used the foodbank last year. Their Family Centre is the only centre for families in Hamilton. The centre helps families with housing searches and landlord/tenant disputes. Women’s services are supplied through Martha House and Mary’s Place: https://www.goodshepherdcentres.ca/womens-services and Youth Services are provided at 3 locations – Notre Dame House, Brennan House and Regina’s Place: https://www.goodshepherdcentres.ca/womens-services. In 2018, 249 youth stayed in one the shelters. Good Shepherd also runs several programs for seniors: https://www.goodshepherdcentres.ca/assisted-living-for-seniors. As Krista, said, literally from cradle to grave! Good Shepherd is in constant need of volunteers and donations. The Family Centre makes up Welcome Baskets and the Women’s Centres require things like toiletries and towels. Youth Services can always use bus tickets and all Centres can use gift cards. Donations can be made at 155 Cannon Street (the old City Chev-Olds dealership). 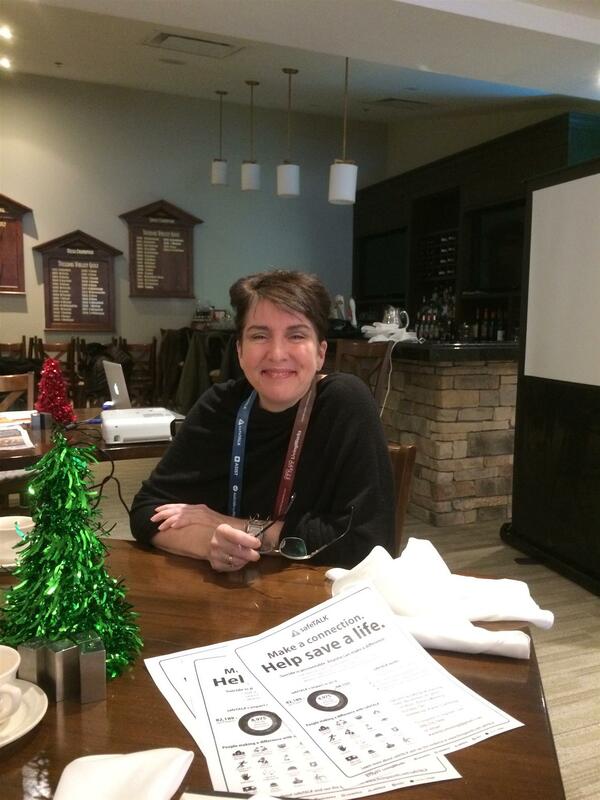 On Tuesday, February 5 our guest speaker was Archdeacon Val Kerr of the Niagara Diocese. Val, of Haudenosaunee decent, grew up East of Bellville and presented on the theme of Truth and Reconciliation. She is a widow with two sons and six great grandchildren. Herself abused she does not dwell on it. She explained the role that residential schools played in disconnecting generations from their parents and grandparents the latter of which typically cared for the children while the parents worked to provide for the family. Val informed us that while some of the schools were okay the purpose was to take the Indian (savage) out of the children. We were informed that Treaties with the Federal Government were supposed to provide Healthcare, Education & Housing but the services are lacking due to inadequate funding. Val also provided some statistics. There are more children in foster care today than were in residential schools. She explained that one hospital in Western Canada took 40 babies at birth to be placed in foster care. She called on the Federal Government to educate indigenous mothers on how to care for their children. Val recommended reading a book titled Seven Fallen Feathers by author Tanya Talaga covering the subject of racism. On Tuesday, January 22 Club Member Dave Carson spoke about the very important issue of climate change. Dave sits on the Board of Environment Hamilton and is passionate about saving this planet! Below is a summary of his presentation. We continually strive to improve our comfort and security and overall enjoyment of life while this contributes to environmental damage. None of this is new…it began back in 1750. and accelerated as technology advanced. On November 27th the Sunrise Rotary Club was pleased to present Jim Sweetman with a cheque for $500 to support the Good Food Box program. “Our objective is to get more fresh fruit and vegetables into the hands of Dundas residents," Jim told us". "Where possible we also want to support local farmers thereby increasing our local capacity to produce the food we need.” It has been in operation since January 2011, hence it’ up to 9th consecutive years food box deliveries. Our speaker on Tuesday, November 27th was Nicole Sinha. Nicole was our representative at RYLA last June in Fredonia New York. Nicole was born and raised in Hamilton and attended Carleton University. The RYLA program is an inspiring week-long personal development seminar for young people 19-27 years old. The 40- 45 participants live in a dorm at SUNY and work together for a week in an intensive environment of co-operation and learning for personal development and self-assessment, studying group dynamics, team development and career development. The program is carefully designed to provide leadership training and experience, including lectures and discussion periods with skilled and prominent facilitators, as well as recreation and fellowship. For Nicole, going to RYLA gave her a great boost in confidence and direction. She decide to go to Ukraine to work in a non-profit and she decided to go on to grad school. She urged the club to support the local Rotoract Club.